Whenever I teach or present on negotiating deals, I get questions. One is how to make things equal on both sides of the negotiations table… which isn’t going to happen. It’s about being fair and making the deal a win-win for all parties involved. It’s not about being equal. So what do I mean by this statement? If you’ve heard me speak or have read any articles on this blog, you know that I talk about the four ingredients to any deal: Time, Knowledge, Money and Credit. These things are not equal; but each have a value. If you know how to take down a deal where your investor is going to make good returns month after month, that’s called value… big value. In fact, that equates to more value than the money or credit someone else can bring to the deal. Think about it this way… if not for your knowledge and time, deals won’t get done. Investors who will let you use their money and credit in your deals likely don’t want to go through the education that will give them the knowledge of how to do different types of deals; they probably won’t want to put in the time to make deals happen either. A lot of times the investors who will back your deals are looking for returns… they don’t want to be involved in the day-to-day operations… they just want to make good investments that make fiduciary sense. When you’re negotiating terms with sellers, buyers and investors, something you need to remember is that your time and knowledge are very, very valuable. Now let’s say that you want to buy the property so you can hold onto it and use it to create cashflow as a rental. What will you say to the seller to get the property and how will you negotiate the deal? The exciting part is that you get to figure out what you will offer the seller for the property… and maybe he doesn’t even know he’s a seller YET. That’s the beauty of off-market properties. There’s no real estate agent involved, no sign in the yard, no plan on the homeowner’s part at that first glance that he wants to sell… until you talk to him. Everything can be negotiated. The price, the appliances, the furnishings if you want them, the terms… everything. That’s the fun stuff for me! Oh, boy, I bet your stomach took a churn when you read that last line, huh? Maybe it sounds really scary to negotiate with buyers and investors. Believe me, it’s not. Remember this… buyers and investors are human beings just like you and me. They are people with eyes, ears and brains. That’s it. They are not elusive creatures that are so hard to find that you’ll have to know secret knocks to get into places to talk to them. Not by a long shot! As people, they don’t want to be taken advantage of, they want to see the numbers, they want to understand what you’re doing and why, they have to match your Investor Identity and they need to be willing to chat with you. Buyers are looking for something specific. Once you know the type of properties they want, you can fulfill that request. That’s why developing your buyers list first is so important if you won’t be holding onto the properties as rentals. If you have something they want or need, good deal. Close the deal. Negotiate the terms you want. Shake hands, get the paperwork done and move on to your next deal. Investors are also looking for something specific. Find out what that is and you might have investors not just for the deal on the table today but for deals far down the road. There are a number of investors who have participated in a few of my deals… not just a single deal only one time. These individuals may start out as strangers you’ve met at Starbucks, but over time you get to know each other, trust is built and deals are done. Forging relationships is a lot of what you do as a real estate entrepreneur. No two deals are the same. Whether you are doing buy-n-hold deals, wholesaling, fix-n-flipping or buying huge apartment buildings, one thing is for certain. You’re going to learn to be a great negotiator. The information shared in this course comes from my own experiences… and not other people’s experiences… and the tips and strategies actually work like a charm. To be a great negotiator you have to get good at assessing properties and all the details… looking at everything inside and out, figuring out the costs so you can make good offers, and then being clear in your presentation of your offer. It is not brain surgery; it is not magic; it takes a little time to get good at, but you can do it. This is a solemn promise. You want to know my secret to successful negotiations? I ask for everything I want and then some. That’s always a great starting point. By doing this an atmosphere is created wherein the seller will get things in the deal that he wants, which we can call wins. I’ll get what I want, and that’s a big win for me. It’s very exciting to negotiate deals. Of course, I didn’t always feel that way. In the beginning of my real estate entrepreneurship journey I was scared to talk to people much less negotiate with sellers, buyers and investors. Truth is… I could not fail. In other words, failure was not an option. If you know my story, you also know I was broke, had a credit score of a whopping 398, my family home had been foreclosed and we were squatting in bank-owned property, and I was a mess. There was no money for marketing to get leads; I had to get out there day after day to meet sellers, buyers and investors. Then I had to get myself in front of them so I could share my goals. … And where you could be very quickly! I started out as a wholesaler, earning 6 figures my first year doing it. I tried a little fix-n-flipping, but that wasn’t for me. (I actually stunk at it.) Then I started buying and holding properties to create clean, safe, affordable housing for people in Memphis and then other states. I did a bit of commercial investing and today I’m lovin’ the vacation rental housing space! Regarding that space, I promise I’ll share a few livestreams I’ve done on the topic soon. It’s something on my immediate to-do list. I’ve been pretty busy setting up my first 4 – yes, 4 – short-term rental properties and have been building my system for doing more. By end of 2016 I should have at least 4 more! Getting all these properties under contract in a matter of just a few weeks entailed, you guessed it, negotiation skills. You can access a few of my latest livestreams I did from a couple of my newest vacation rentals. Go here and like the page to gain access: https://www.facebook.com/CashflowDiary. And be sure to watch my replays on https://www.periscope.tv/CashFlowDiary/1lPKqzlrqkMGb. For now, what you need to know is that I didn’t get here overnight, it took learning the skill of negotiations and that I trapped myself into success by taking the steps I needed to take. I put myself out there and was willing to make mistakes. I made plenty of mistakes, too! What came of all these mistakes is my ability to negotiate deals in a way that works for everyone involved. No one has to be the great conqueror; everything’s not going to be equal, but all terms will be fair. The seller will be happy, the buyer (if you’re a wholesaler or flipper) will be happy, the investors will be happy (because you need them for most deals unless you have been stockpiling cash – in which case maybe you should consider being an investor in other people’s deals to earn checks over the long haul) and you will be happy… if you negotiate well and if you negotiate fairly. 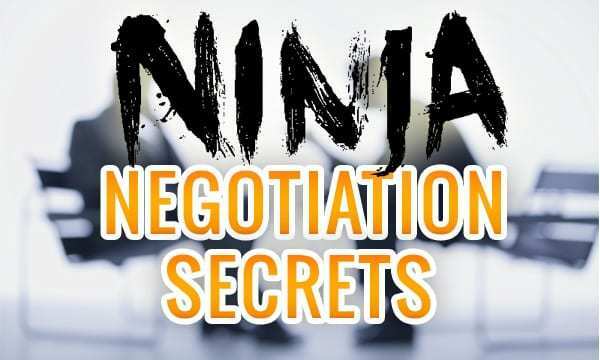 You want to learn EXACTLY how to be a masterful negotiator?